Author Madalyn Kinsey will be featured in the Fishers and Noblesville Magazine. To read the full article please use a link below. 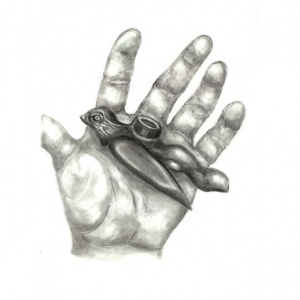 Illustration of Hopewell effigy pipe. One of the important plot points in The Ghost of Cheeney Creek is the illegal looting of Hopewell Indian artifacts from an undiscovered burial mound located in Hamilton County, Indiana. Such a looting occurred in real life in 1988 resulting in the imposition of a year in prison for the man found guilty of trafficking in artifacts illegally removed from a Hopewell burial mound on property owned by GE near Mt. Vernon, Indiana. The burial mound was discovered by accident when a heavy-equipment operator cut into it during a highway construction project. Thousands of artifacts were removed from the Indiana site, including tooled leather, copper axheads, jewelry, and rare silver instruments with the reeds still intact. The Hopewell Indians occupied Indiana from 900 A.D. to 1300 A.D. The Hopewell culture participated in long-distance trading networks. This allowed them to acquire copper from the upper Great Lakes, mica from the Carolinas, shells from the Gulf of Mexico, and obsidian from the Rocky Mountains. Magnificent works of art were crafted from these exotic raw materials, such as a large carved mica hand, decorated ceremonial pottery, and ornate carvings decorated with fresh water pearls, sea shells, sharks’ teeth, copper, and even silver. The Hopewells also built great geometric earthworks (or mounds) that are among the most impressive Native American monuments throughout American prehistory. The function of the mounds is still under debate, but believed to be ceremonial, not for burial. For eighth-grader Vanessa the easy-going life of summer vacation stretches before her in all its glory. Her visions of sleeping late every morning and watching as much television as possible evaporate quickly, though. Her mother has arranged for her to spend two weeks with her aunt, uncle, and cousins she barely knows on a farm! 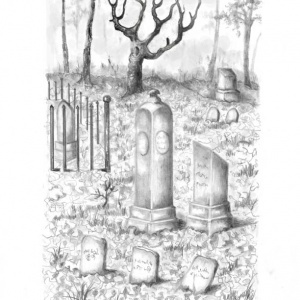 Making matters worse, the farm is haunted by a Civil War ghost reisiding in a cemetery only steps from the house. This is definitely not the plan she had in mind for her summer of 1967. 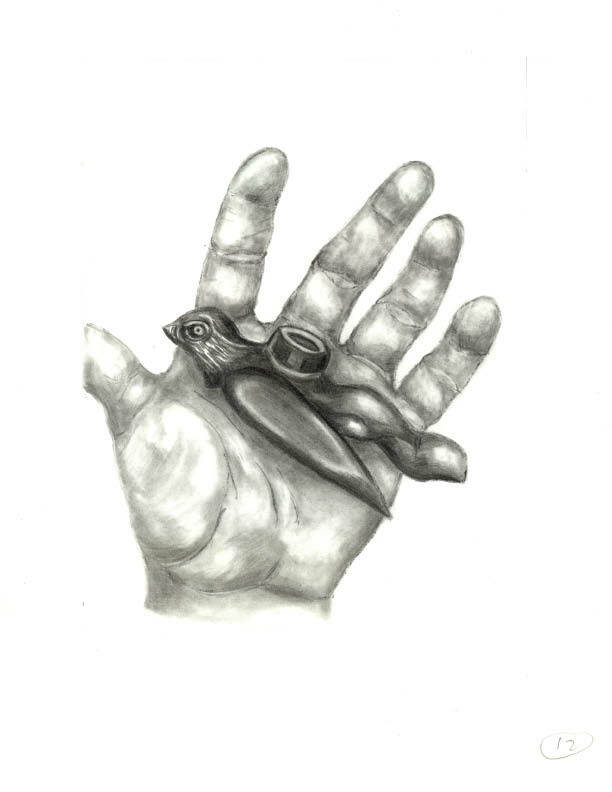 An illustration from The Ghost of Cheeney Creek drawn by Sharon Cazzell. Occasionally, people ask about visiting the cemetery described in The Ghost of Cheeney Creek after reading the book or attending one of my book chats. For instance, last week the girls of Girl Scout Troop 1656 in Noblesville, Indiana, hatched a plan to have a sleepover after they read the book, and then visit the cemetery. The cemetery is very old. The last burial in it was in 1907. Mostly Eller’s and Allison’s are buried there. No one seems to visit those graves anymore, from the looks of it. It isn’t on a public street, or on any street, for that matter. It’s located roughly in the area of 106th Street and Allisonville Road in Fishers, Indiana. The best way to find it is to go into the Gatewood subdivision just north of that intersection off Allisonville Road, and then work your way to the south, finally parking in a cul-de-sac facing a woods at the end of Woodridge Lane. Walk along a grassy path south and you’ll find it. The grave of Civil War soldier (some say deserter) James Payne, the muse for the ghost of James Parker in the book, is the first grave you’ll encounter, off alone in a rocky corner under a tree The cemetery is secluded; surrounded by woods, and framed by Cheeney Creek as it winds through the area. You might just see the wisp of the ghost of James Payne as you stand near his grave (if you’re lucky)! In Chapter Nine of The Ghost of Cheeney Creek, young Vanessa and her cousin Emma visit the Glendale Mall in Indianapolis. That was in June, 1967. Back then, the mall was open-air, with the stores arranged around a large open space filled with fountains and shoppers walking from store to store. 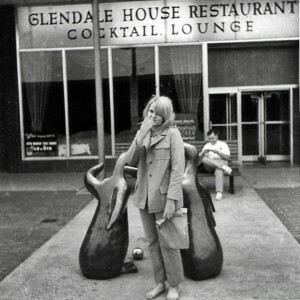 In addition, just outside The Glendale House Restaurant, a sculpture of three child-sized, shiny bronze penguins stood in a circle around a silver ball. They were commissioned by the architect of the mall, Victor Gruen, and created by Kansas City artist, Arthur Craft (1922-1977). Craft was known for his colorful mosaics and stylized bronze animal sculptures installed in Kansas City, Cleveland, and other cities. The penguins beautifully captured a sense of movement and whimsy. They were meant to be crawled on, and affectionately mauled, by children, and they were! Named Wynkin, Blykin, and Nod after the famous poem, they stood in the elements from their installation date October 12, 1960, until the mall was enclosed in the 1970’s. 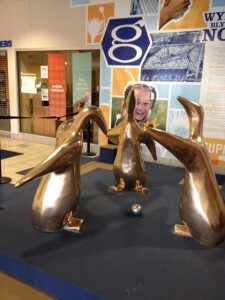 After the mall was razed in 2005 and rebuilt in a different configuration as the Glendale Center, the penguins were lovingly restored and placed in the lobby just outside of the branch of the Indianapolis Public Library located at the Center. Those who had known the penguins as children sighed with relief that they would continue to be a part of the Center and protected for future generations to enjoy. One of the photos above is of my cousin Jane standing near the penguins in their original location in 1967, and the other the other is a photo of the penguins in their current location taken in 2015. At a recent book signing, a man named Joe told me that his first summer job was in maintenance at the Glendale Mall, and his first task each day was to wipe down the penguins. Joe’s an Executive Vice President at a national bank now, but you could tell he was pretty proud to tell me about his connection to the penguins. 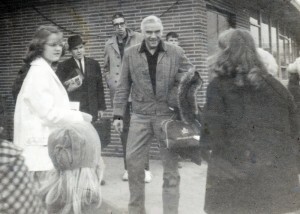 Lorne Greene greeting cousins Jane, Ellen, and Martha at Weir Cook Airport, 1961. In May, 1961, Lorne Greene, the actor known for portraying patriarch Ben Cartwright on the long-running TV western, Bonanza, came to Indianapolis to be in the annual Indianapolis 500 Festival Parade and to attend the race. He wasn’t the grand marshal of the parade this time. He would have to wait until 1967 for that honor, which he shared with co-stars Michael Landon and Dan Blocker. His arrival in Indy was a big deal to many of us, because celebrities didn’t come to Indianapolis very often back then. My Aunt Betty drove cousins Jane, Butchie, Martha, and Ellen out to Weir Cook Airport to see him arrive and to get his autograph. Back then, travelers walked down a staircase pushed up to the plane and then across the tarmac to the terminal. There was no security or TSA to contend with. So, you could easily see people as they arrived and walk right up to them if you wanted to. Bonanza had been on TV only two years at that point, and would run another 12 years before it was retired (but continued in syndication). After NBC moved the show in September, 1961 to Sunday evenings at 9:00, the show soared to number one and stayed there for many years. Lorne Greene was a Canadian actor known for serious roles and Shakespeare before Bonanza. You can see in these photos that he’s traveling in his Pa Cartwright TV costume. He must have really bought into his character! He even named his home after the name of the ranch on the show, The Ponderosa II. Cousin Jane reports that as he approached the crowd of teenagers waiting for him that day, he looked less than thrilled. Perhaps he was still adjusting to being a celebrity. My cousins got his autograph, of course.There’s a reference to all of this in Chapter Ten of The Ghost of Cheeney Creek where the family decides what to watch on TV and settles on Bonanza after a brief discussion about going to the airport to see him. A.J. Foyt won the Indy 500 race in 1961. The Official Pace Car for the race was a custom-made, gold Thunderbird convertible with a white top and pearl beige interior. It was given to A.J. as part of his winnings. It’s rumored that A.J. gave that Thunderbird to his mother. Some lucky lady! 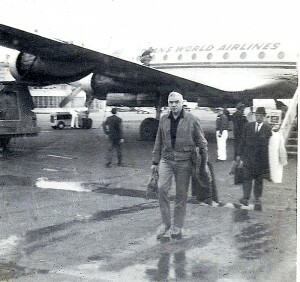 Lorne Greene arriving in Indianapolis in 1961. 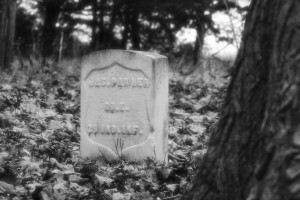 A couple of years ago, perhaps in 2010, SyFy Channel’s paranormal investigation program, Fact or Faked, came to Fishers, Indiana, to investigate the grave of Civil War soldier James Payne at the request of a local resident who claimed his ghost was menacing her nearby home. Of note is that the ghost of Civil War soldier James Parker in The Ghost of Cheeney Creek is loosely based on James Payne. The author was unaware of this investigation until it was brought to her attention by a family member half-way through the writing of the book. 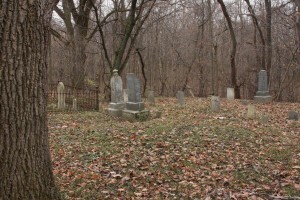 Before the investigators on the show came to Indiana, they were presented with a video of a night-time paranormal investigation of the cemetery in which a globe of light flew past the camera recording the event. The folks on the show were so impressed by the video that they came to Indiana to investigate its authenticity by attempting to re-create the floating globe of light by non-paranormal means. They were unable to do so, and declared that what was depicted on the video was an authentic paranormal event. Later, TV viewers challenged that conclusion, claiming the globe of light was nothing more than the reflection of light on a spider hanging in its web. Is it that simple? 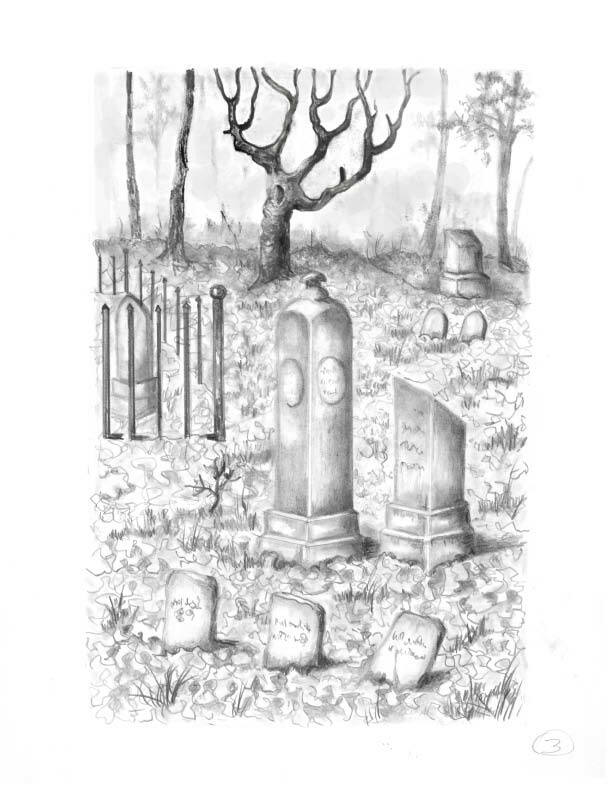 A Youtube of the investigation of the cemetery described in The Ghost of Cheeney Creek can still be seen by searching “Caretaker Ghost Fact of Faked Youtube.” What do you think? James Payne – Reaching Beyond the Grave? Although I didn’t know it when I wrote The Ghost of Cheeney Creek, James Payne, the Civil War soldier on whom the ghost in the book is based, is listed as a deserter in the military records kept in the Indiana State Archives. His grave is located in a lonely, rocky corner of the small county cemetery on what was once my mother’s family farm. I thought it would make an interesting story to have his ghost haunt my cousins in order to spur them to investigate his death and prove he wasn’t a deserter. Half-way through writing the book, my brother found an on-line record that James Payne was listed as a deserter. I’ve since found more information indicating that he deserted at Tyre Springs, Tennessee, on September 15, 1862. What a strange coincidence! Was I manipulated from beyond the grave to write this story? I’m still a bit unsettled by the possibility. I guess we’ll never know. Oh, one more thing. I visited his grave a few weeks ago. When I took out my phone to take a photo of his headstone, it went totally dead. When I returned to my car, the phone came right back on. More ghostly manipulation? © Madalyn Kinsey · All rights reserved.